Congratulations on becoming parents! The introduction of a baby into the home can bring a new dynamic of both joy and stress. Oftentimes, many families face the unique situation of bringing a new infant into the world and introducing that bundle of joy to their four-legged companion. It’s important as new parents to find the proper obedience training for dogs to ensure that your new child is safe and that your furry child is prepared for the new challenges ahead. As Cincinnati’s dog training experts, we are here and ready to help! The Dog Wizard is here as a proven dog obedience training school, providing quality instruction that works to help you and your furry friend get the most out of life. Our team of certified, professional dog trainers will work to teach you as well as your canine the best techniques for maintaining discipline in a wide range of unfamiliar situations. Today, we’ll discuss the importance of baby-centered dog obedience training classes, as well as the value of investing in your pet. If you are curious to learn more, be sure to contact us with questions today! Dogs speak through body language instead of words. While your pet is a good listener, they primarily center around body movements to express feelings and intentions. The inconsistent and erratic movements associated with very young children make this a safety concern, as your dog may react differently when under pressure. Your dog may react to pain. One common action that elicits a bite or bark stems from surprising your canine with sudden pains. Normally, this occurs when children step on the dog’s tail, or their paws and ears. Another knee-jerk reaction can come from the pulling of hair, as young children often have a fascination with the soft fur of many dog breeds. Dogs need an escape route to remain calm. Small children bring a lot of energy to any room, which can put your canine under a lot of stress. If your dog is cornered and unsure as to how to handle the situation, an aggressive reaction may be the first reaction. Dogs will always show signs of stress before biting. Contrary to what many people claim, dogs will typically not arbitrarily lash out of nowhere when in the presence of a young child. As the parent, you can keep an eye out for changes in your dog’s behaviors and body language. Properly readying your pet for the arrival of baby is important for minimizing disruptions and unexpected behaviors. Dogs are creatures of routine, and mixing up their daily habits can be the source for great amounts of stress. From the morning walks to sitting with Dad on the couch, regular activities can vanish when the baby arrives. The stress of multiple changes in your dog’s life can be compounded by the fact that they are now being yelled at for transgressions they’ve had no prior experience with. The combination of losing time and attention to the infant can create a negative association for your dog. Preparing for these changes is tantamount for ensuring a smooth transition for your growing family. Easing into new roles and introducing your dog to new smells and sounds can help to minimize the stress brought on by such radical changes in the family dynamics. If your canine was allowed on furniture, be sure to introduce the rule of no pets on furniture now, as it can add to the stress once the baby is home. Adjusting with your pup for these changes will be hard, but putting in the efforts now will make everyone happier in the end. Baby preparations may be a major part of your life, from painting the room to finding a pediatrician, yet your four-legged friend is often lost in the mix. It’s entirely beneficial to put in the time and training now to keep your dog happy and your baby safe. Next time, we’ll look at a few suggestions that can help you and your dog when prepping for the newest addition to the family. The Dog Wizard is here to offer Cincinnati dog training classes of all types to help their dog get the most out of life. 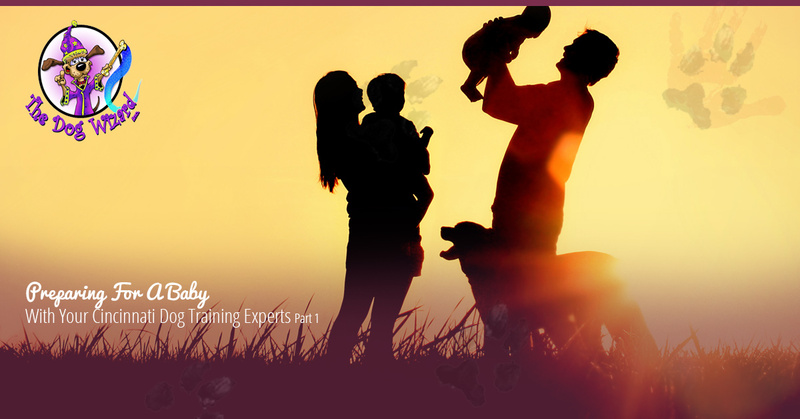 From dog aggression training to baby prep, our certified dog trainers are here and ready to optimally train your dog (and you!). Contact us today to learn more about our classes!